In this chapter, we present the supervisor localization approach in detail. 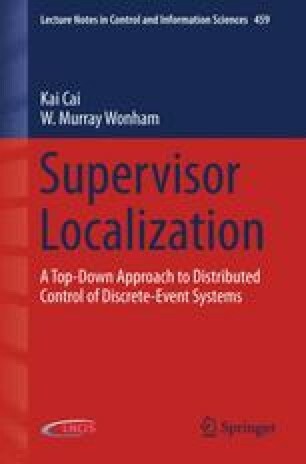 After reviewing the basics of supervisory control theory, we formulate the distributed control problem for discrete-event systems: compute one local controller for each agent, such that these local controllers collectively enforce the same controlled behavior as the monolithic supervisor. The central concept of localization is that of control cover, which proves to be both sufficient and necessary for the controllers obtained by localization to solve the formulated problem. An algorithm is then presented that automates the localization procedure, and a language interpretation of localization is provided. Finally, two boundary cases of localization are identified which indicate, as a property of the localization problem itself, an extreme degree of ‘easiness’ or ‘hardness’, respectively.